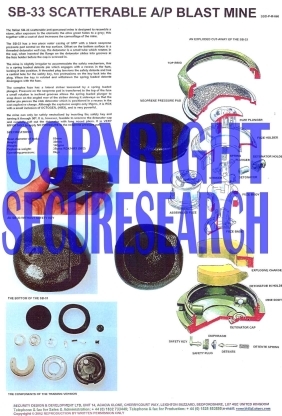 This security poster illustrates the SB-33 Scatterable Italian Anti-Personnel Blast Mine. This ground blast mine has an ultra slim body with no protruding pressure plate and is designed to look like stone. This design makes the mine easy to conceal. This anti-personnel mine is also designed to be dispensed by a helicopter for area denial. This security poster features the technical specifications of the SB-33, an extremely detailed exploded cutaway of the SB-33. and photographs of the SB-33 without the safety key, the bottom of the SB-33, and the components of the training version. An extremely detailed exploded cutaway of the SB-33. Photographs of the SB-33 without the safety key, the bottom of the SB-33, and the components of the training version. The technical specifications of the SB-33. This security poster features the technical specifications of the SB-33, an extremely detailed exploded cutaway of the SB-33. and photographs of the SB-33 without the safety key, the bottom of the SB-33, and the components of the training version.